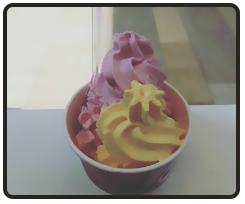 Try something a little bit different when you stop by our frozen yoghurt and bubble tea bar. With such a wide selection of drinks, frozen yoghurts, ice creams, shakes, and slushies available, you’re sure to discover a flavour that puts your palate into overdrive. Established in 2011, Mee Cha is a bubble tea and frozen yoghurt bar that offers a variety of flavoursome treats in Birmingham, West Midlands. It’s not just our cheerful disposition that makes our drinks so tasty, however. It’s the fact that we produce our treats using quality ingredients. When you’re in the mood for something vibrant, quirky, and delicious, visit our parlour and enjoy our one-of-a-kind fruit slushies, ice-creams, and shakes. Perfect for groups and kids, our parlour has capacity to seat up to 12 people. Plus, you’re free to order your drinks and desserts to go. Parking spaces are readily available, making dropping by as convenient as could be. Visit us today, in Birmingham, West Midlands to enjoy delectable desserts and drinks that burst with flavour.